Group portrait of the Penlop (Governor) of Tongsa (Trongsa), Sir Ugyen Wangchuk and his councillors at Punakha, Bhutan, taken by John Claude White in 1905. 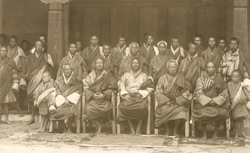 The front row are identified by White as follows: 'son of Thimbu Jongpen, Punakha Jongpen, Thimbu Jongpen, Tongsa Penlop, Zung Donyer [dronyer], Deb Zimpon, and elder son of Thimbu Jongpen'. The Imperial Gazetteer of India defines the office of Deb Zimpon as a 'sort of private secretary to the Deb Raja' and the dronyer as the official in charge in the absence of the Trongsa Penlop. Dzongpens are lords of the Dzongs. A similar portrait, taken on the same occasion, appears in The National Geographic Magazine (Apr 1914, p.412), and in addition to identifying the elder son of Thimphu Dzongpen as Ugyen Dorji, describes the retinue of standard bearers and armed guards not visible in the photograph. This is one of a set of photographs documenting John Claude White's mission to Bhutan to invest the Trongsa Penlop with the order of Knight Commander of the Indian Empire. The Penlop had assisted the Younghusband Mission to Lhasa in 1904 which had wrested a favourable settlement from Tibet.